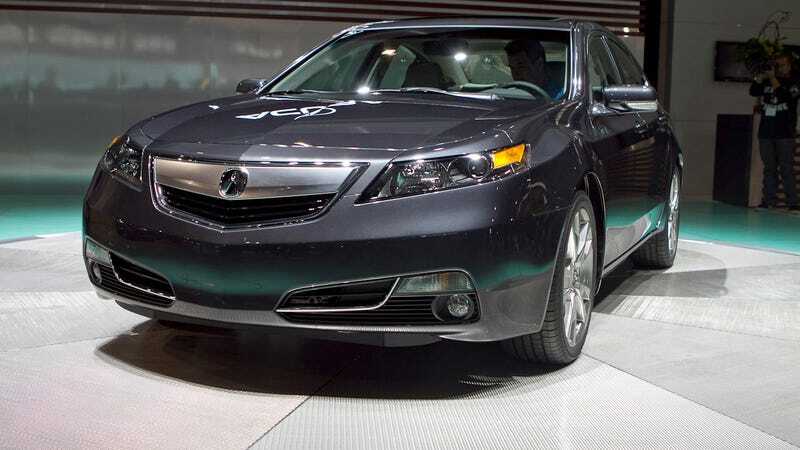 Like a young Jennifer Grey, the 2012 Acura TL is on the receiving end of a major nose job. Unlike the Dirty Dancing actress, the TL will actually benefit from the change. You see, when Jennifer Grey underwent rhinoplasty it ended up robbing her of her distinct appearance and otherwise made her unrecognizable and mostly uncastable at the height of her career. The current TL is also recognizable for its schnoz, but only because children point-and-laugh when they see one. No car company wants to their products anonymous, but Acura manages to sell lots of cars to people who make car purchases based on cold calculations about value and efficiency and not emotional reasons. People like Mark Zuckerburg. But the TL's design was too much snout for the most dispassionate car buyer. The new look includes a much revised grille with a beak so small you can barely even call it that (which is sad, because we love making fun of the beak). The headlights are also lower on the new TL and the rear taillights wrap in a more pleasing way. Overall, the addition of more character lines and the reduction in off-putting characteristics reduce the gag-factor without making the car completely anonymous. Acura's range-topping sedan still comes wither either the 3.5-liter 280-hp V6 in FWD trim and the 305-hp 3.7-liter V6 in the SH-AWD version. Both get a new Sequential SportShift 6-Speed automatic with a double-kick-down feature that lets drivers drop two gears and get a matching throttle-blip for spirited runs to Crate & Barrel. Most importantly for enthusiasts, a 6-speed manual transmission will be retained for the SH-AWD option.